An artist with strong ties to Nashville has donated artwork to Vanderbilt-Ingram Cancer Center’s (VICC) Radiation Oncology department for the benefit of patients, both young and old. 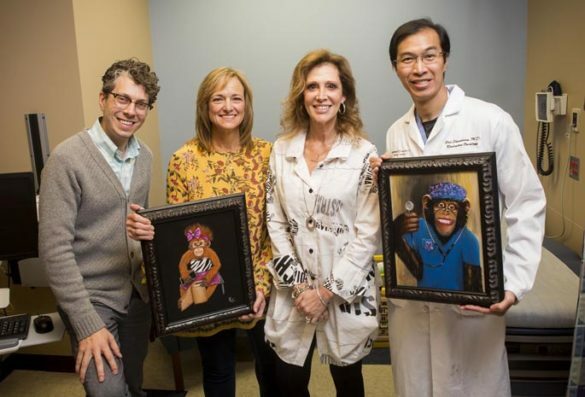 Rhonda Jennette recently donated two acrylic paintings featuring images of a chimpanzee wearing hospital scrubs and an orangutan as a kitchen assistant with paper towels. The Dallas-based artist decided to donate the paintings after talking with her best friend, VICC nurse Leslie Mader, R.N., OCN, who works with cancer patients undergoing radiation therapy. Some of those patients are children. Jennette said Mader was visiting Dallas when the pair started talking about children with cancer. Mader noted that she and other VICC clinicians have to remind their young patients to wash their hands. Jennette had just the painting in mind to illustrate that reminder, a colorful illustration of “Annabelle” the orangutan with a roll of paper towels. Jennette immediately offered to donate that painting and another with a medical theme to brighten up two VICC exam rooms where young cancer patients often meet with their caregivers. “I said, ‘take it,’ and popped it out of the frame. I would have given her every one of them to cheer these kids up,” said Jennette. Mader said she knows her patients will get a kick out of the animal-themed artwork. “They’re going to love it. When children and adults see them it just brings a smile to their faces. It makes you forget. It’s just comical, it takes the seriousness and the gravity out of where you are and what you’re doing,” Mader said. Jennette and Mader grew up in Joelton, Tennessee, and have been friends since the fifth grade. “We were always best friends, spent the night together at each other’s homes and we’re more like family,” Mader said. The VICC oncology specialist was a “born nurse” who was always taking care of her friend, Rhonda, throughout childhood. “This girl was the rough, tough, tomboy, basketball player…she was always on a dirt bike,” Mader said. But Jennette also loved art, and while still a child started redrawing cartoons from the Sunday newspaper. Eventually, she turned to painting and now uses acrylics for much of her artwork. She also loves primates because her father wanted a chimpanzee as a pet but died before he could realize that goal. During frequent business trips with her husband, Jennette visits zoos or sanctuaries to see primates up close. “Who doesn’t love chimpanzees? They’re so playful, they’re fun. I can just get lost at the zoo watching them forever,” said Jennette. Jennette also produces non-commissioned work, including note cards, and donates the proceeds from those sales to two primate sanctuaries, Chimp Haven in Keithville, Louisiana, and International Animal Rescue which is based in the United Kingdom but has worldwide operations, including a sanctuary for orangutans in Borneo. Some of the rescued primates are retired from medical research.